Carolina Belle: This Christmas, we enjoy scents of the holiday . . . This Christmas, we enjoy scents of the holiday . . . 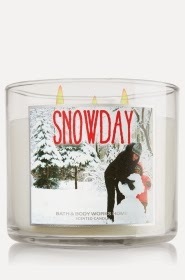 Snow Day is a clean, pine fragrance. It has a very "woodsy" smell combined with vanilla and maybe a little mint. I like this one for the kitchen. 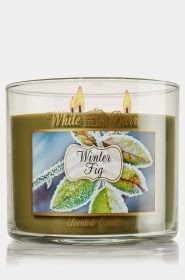 Winter Fig - my favorite candle of the bunch. It's also hard to describe. B&BW describes it as fig with spruce and sugar. Truthfully I don't know what a fig smells like, I love figs but I can't recall a special smell. I love the spruce in this though. Ah, I had to light it as I was writing this post because I love it so much. I can see myself buying another one before the end of the season. 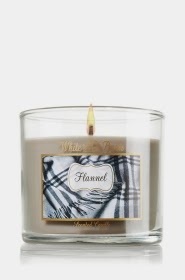 Flannel is a clean, slightly woodsy and slightly musky scent. I probably won't use this until January. I loved this one the first time I smelled it in the store. I'd like to buy the home spray too, it's such a cozy smell. I bought this Spruce Holiday Spray from a local boutique but it can be found here if you are interested. It has a bright woody smell that is perfect for spritzing on your faux tree or garland. I spray mine every afternoon when I get home. I love picking out holiday candles, unfortunately I can't spend a lot of time in fragrance stores because I get headaches from too many scents. I'd feel safe choosing these every year, that way I'm in and out. Have you found a great new scent lately? I love home fragrance and I love suggestions!